We love Syracuse, NY and we love to help other people, be they visitors or transplants, to love it too. As with our previous list this list is designed to be the insider’s guide – or a complete list of those things that you might not have discovered unless you live here. It contains specific activities, foods, places, or things that you just have to do when you visit Syracuse. PLEASE NOTE – The determining factor for the items that made the list is uniqueness. If something was great, but could be done anywhere, we probably left it off the list. (ie – “Dance at Fuel” although fun, can be done pretty much anywhere). Also – I didn’t get into the myriad of Syracuse fests (ie. Taste of Syracuse, Syracuse Nationals, Irishfest, Jazzfest, etc), which may be the next top 10 list. There’s some culture for you – whether you like it or not! This item will practically turn your shirt orange within minutes, (and your face red!). The sandwich is a Roast Beef & Stilton cheese (a bleu cheese variety), it is slightly on the spicy side. Take in the surroundings, the atmosphere, the people, and the ridiculous selection of beers the Blue Tusk has to offer. If you’re a beer lover, be adventurous! Get something from the cask! You’ll automatically earn Jesse‘s respect. Also, when there, try some locally brewed Middle Ages beer. old country about it, that you can’t help but gather your Irish draw, and sing “..and her eyes shown like diamonds, you’d think she was queen of the land..AND SHE WAS! !” on the way home. Grab a Blarney Burger while on Tipp Hill, at $4.75 you’ll wonder what magic they weave to make such a delicious deal. 8. Go to a Cuse basketball game at the dome, preferably during the NCAA Tournament. If you’ve ever been to Syracuse, you know that this town eats, sleeps, and breaths Syracuse sports. The town lives for it, and we have one heck of a venue (the Dome) for it. Prebar anywhere on the SU Hill, paint your face orange, take a walk on Marshall street. Once inside, you must get a ‘dome dog’, something about getting a hot dog wrapped in tin foil that makes it so appealing – why is that?? The craft brewing and food truck scenes have exploded in recent years in Syracuse. Head to Local 315 Brewing on a day when Toss n Fire Pizza is there. Kill two birds with one stone and pet goats while you are at it. Get the Salt Potato pizza and Don’t Fear the Dark Stout. Every year some guy(s) set up a floating spit on the water, and girls/guys come on their boats, jetskis, (even canoes), from all over Oneida Lake to take part. It’s basically an all-day event, and you’re free to pull up, blast your music, and get some sun. The Horned Dorset and The Krebs. The Horned Dorset in Leonardsville serves a blend of traditional French Cuisine with a contemporary twist using produce grown in the restaurant’s own organic gardens. The Krebs in Skaneatles is a farm to fork restaurant with a conscience, they donate all net proceeds to various CNY women and children’s charities. Both restaurants will blow you away with the quality of their service and food. Try not think about the cost- they rival any experience in a larger city and it’s worth it for a special occasion. No Syracuse list would be complete without a shout out to the Dino. Without a doubt the best BBQ, (arguably the most signature restaurant in Syracuse), as well as an unparalleled Biker/Blues scene. Make sure to pile on the slatherin’ sauce! This one is 3 fold: 1) Visit Buttermilk falls, & explore the trails surrounding the falls 2) Stop at the “Books” barn (a red barn somewhere on route 13 that reads “Books”) 3) Get a relaxing dinner anywhere outside in the Ithaca Commons area. First the falls literally look like buttermilk, and you can swim at the base! It’s an incredible paradise as well as the miles of trail that you can walk around the falls (which may be close to some hidden gorges not on the map, hint hint). The Books barn is just something you have to see to believe, it’s an old barn that has basically been converted to a huge archive of books, and literature. Last, if you’ve ever been to downtown Vermont, you may have an idea of what to expect. It’s got that escape back to the 60’s feel to it, and wherever you are, you’re never far from beautiful landscape, and breathtaking gorges. One of the absolute best, (and most fun) things you can do in NY is visit the Cayuga Wine Trail in the summer. The drive is spectacular in the summer heat, with the windows down (please don’t drink and drive obv). It’s a vacation right in NY; tasting little shots of differing wines, maybe buying a bottle, taking in the history and life of the area that went into the wine, and not to mention meeting new people! In the beginning, everyone’s shy and polite, but by the 5th or 6th vineyard, and 4th time running into that elderly couple from Cazenovia, you’ll be singing the Three’s Company theme song and high-fiving. I’ve heard it’s great with a group (renting a limo or finding a friend who doesn’t drink, good luck I’ve been looking for that guy for 5 years), and it’s especially amazing with someone you love. If I had to choose a favorite, I would recommend a riesling, probably the one from Cayuga Ridge. Or try one of the wines made from the Cayuga White Grape which was cultivated for the region, Lucas Vineyards makes one of the best. Keyword being ‘sing’, if you’re gonna go, you got to sing. Despite the slight pollution level, somehow it is still a beautiful spot to run, and work out. It’s well maintained, and there is usually a lot of ‘good scenery’ there as well to enjoy. There’s also a volleyball court there, and skate park for those with insurance. There’s around 9 frillion things to do at the fair, you’ll honestly not run out of things to check out. The butter sculpture is worth a look, definitely get a wine slushy and take a mini-wine tour in the wine tent(s), then later take a nap on the massage pillows in the Center of Progress building, the guy working there loves it when you do that. Also, I’m told to try the Gianelli Sausage at their stand, then commence the “You’re Abe Froman? The sausage king of Chicago?” jokes. 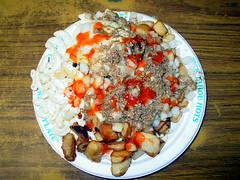 It’s kind of like a garbage plate at Nick Tahoe‘s there in Rochester. They used to post your pic if finish it. I’ve heard rumors of people using entire bottles of ketchup in the process, one word: awesome. Classic drive-in, pull up, tune in your car’s radio to the station – it’s like $6 for a car for 2-3 movies. Riley’s is located on the north side (map), and features authentic Irish music, food, and atmosphere every St Patrick’s day. Riley’s is also noted for it’s annual “Testicle Festival”. There’s nothing quite as surprising as when taking a client out to lunch and the Testicle Festival is going on. Put simply, our work builds organizations. We've worked with organizations in both public & private sectors; including but not limited to: engineering, consumer goods / retail, manufacturers representatives, electronics manufacturers, non-profit (religious, human rights, literacy, education, incubators, disease research, more), professional services, IT services, entertainment, sports, special events, churches, and more.